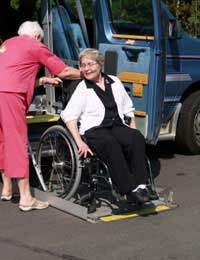 Having issues with mobility can present daily challenges but nothing makes it quite so difficult as dealing with adverse weather conditions. For those in retirement and who are already coping with mobility difficulties, this is something that many fear. It can be isolating, cutting you off at home – as well as increasing your heating bills! Snow and ice make it harder to walk or use mobility vehicles, and sleet or heavy rain can make getting about really difficult too. The safest thing to do when there’s a particularly severe bout of adverse weather such as snow and ice, is to try not to go out or travel if possible. It’s easy to slip and fall, or have an accident if the roads are icy. But this isn’t always possible, and you may need to shop for food or visit the doctors or pharmacy for treatment or medication. If you need to go shopping, it might be worth checking with friends or neighbours by calling them on the phone, to see if they can either go with you, or perhaps even shop on your behalf. Many chemists have a delivery service for medication, so look into this too. If you are a proficient user of the internet, plan ahead when bad weather is on the horizon and perhaps order food for delivery. It may be a good idea to have a mobile phone as this can be very helpful in bad weather. If you are stranded somewhere, you can ring from your car, for example. It’s something helpful to have all the time anyway, for those with mobility issues. But remember to take it out with you, fully charged! Your local authority will be able to give help and advice for those who have mobility issues and who are struggling with adverse weather conditions. They may well have a list of numbers for local volunteers – many of whom have four wheel drive vehicles – who can shop and help those who are having trouble getting out and about. Those who move more slowly in icy cold conditions are more prone to frostbite so make sure you are adequately dressed up for the warmth. And if you have a fall, remember the RICE procedure for both issues… Rest the injured part, Ice pad should be applied to the injured area, Comfortably support the injury and Elevate the injured area. If it’s serious call an ambulance, but if less urgent, NHS Direct can help too. Make sure you have your mobile phone with you!